Description: This memorial marker consists of a small granite stele approximately four feet tall by two feet wide with two metal plaques, most likely made from bronze. 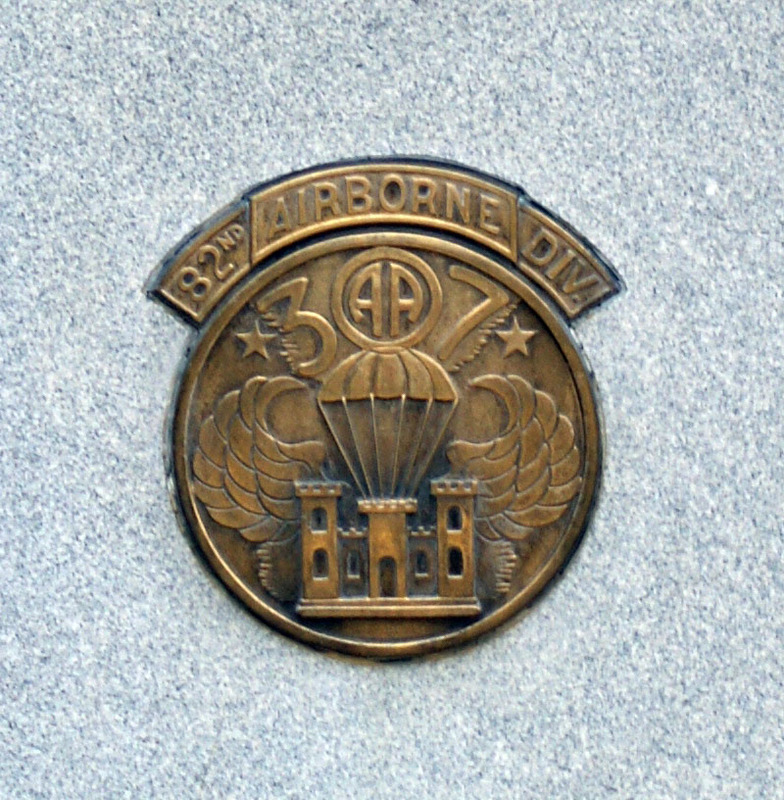 A rectangular plaque with the commemoration is affixed to the top of the angled front face, and the lower, vertical portion of the front has a metal medallion with the image of the insignia of the 307th Airborne Engineer Battalion. The inscription is framed on the left by an image of the United States Army Airborne Patch and on the right by an image of the United States Army Glider Patch. 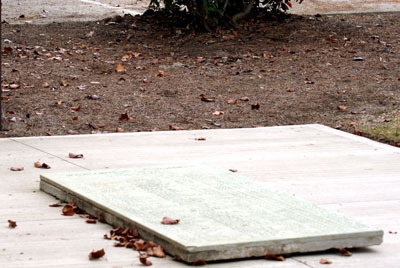 Directly behind the monument and mounted to the paved foundation is a rectangular marble plaque approximately five feet long by two feet wide. Commemorating the historic crossing of the River Waal in Nijmegen, The Netherlands, this plaque was originally located at the site of the river crossing and given by gift to the 82nd Airborne by the citizens of Nijmegen. Unveiling & Dedication: The marker was installed for the 50th anniversary of the operation to secure the Nijmegen Bridge on September 20, 1944. The dedication of the marker may have taken place on the anniversary on September 20, 1994. 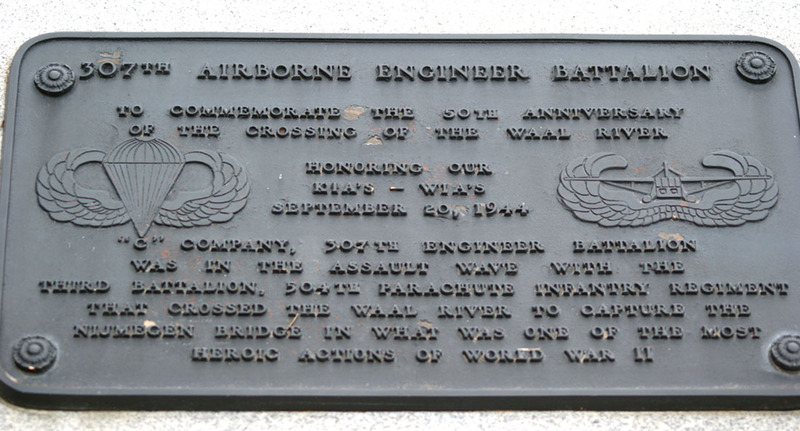 Subject notes: The plaque memorializes the "C" Company 307th Airborne Engineer Battalion effort in World War II and, in particular, their heroic crossing of the Waal River near Nijmegen, The Netherlands as part of Operation Market Garden during World War II. On September 20, 1944, "C" Company, as well as the 504th Parachute Infantry Regiment, conducted five crossings of the river under heavy machine gun, sniper, and mortar fire and eventually captured the Nigmejen bridge to gain a strategically important stronghold on the opposite side of the Waal River deep behind German lines. In all, "C" Company sustained 34 casualties including 8 killed in action. The commanding officer, Captain Wesley D. Harris, received the Distinguished Service Cross for his actions on the day. 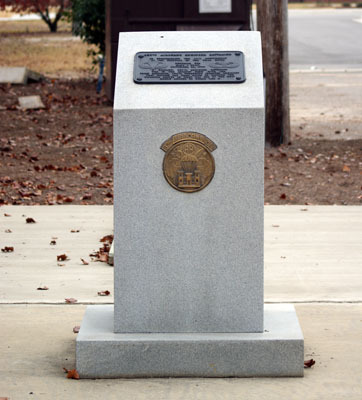 Location: The marker is located in the memorial garden area outside the 82nd Airborne Museum on Ardennes Road. Landscape: The marker is located on a paved square in the established garden area and is surrounded by garden plantings and other memorials. A wooded area sits behind the marker, and the museum is located several feet away along a walkway.